Figures supplied by the factories to the Department of Agriculture for last week show the overall kill to be 36,373. Interestingly, however, they also reveal that average cull cow prices, while reduced, are far from the disaster portrayed by some. 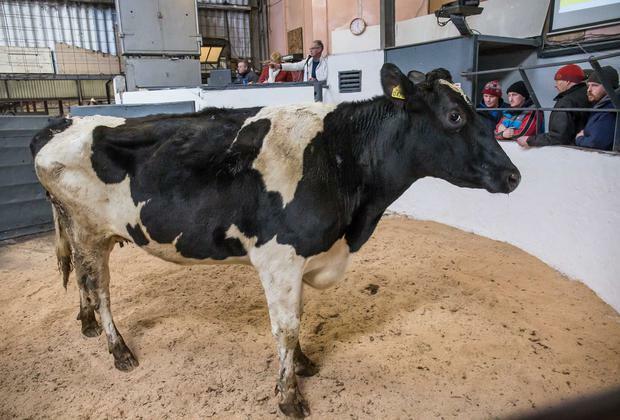 Your P-minus cow is bottom of the conformation table but her price once she had reasonable to good cover on her ran on average from €2.93/kg for a P-2 to €3.07/kg for a P-4. Better P-grades made €2.48-3.08/kg on average, according to Department figures. The P1 cull cow price ranged from €2.10-3.04/kg. Looking at bullock and heifer prices, the feeling yesterday on the ground was that while factory bosses might be keen to pull prices another 5c/kg, they were finding the going tough. In a nutshell, if you have bullocks to sell, you should be getting €3.90/kg, while your heifers should realise €4.00/kg – although some agents are trying their hand at €3.85 and €3.95/kg respectively. The market for young bulls also continues to be sticky. Quotes for under-24-month bulls yesterday saw Us on €3.95-4.00/kg, with Rs on €3.80-3.85 and Os back at €3.60-3.65/kg. Under-16-month bulls are on a base of €3.80-3.85/kg. One finisher/agent I spoke with said that with cull cows clogging the system, men with bulls should book their stock in well in advance. “If you’re doing the job half right you know when your bulls are going to be over-age, so book them in early and avoid the drama,” he said. The message is clear: don’t leave working-out dates and paperwork to the last minute. The same goes for your bullocks and heifers. Returning to the cull cow, her price has largely stabilised at €3.30-3.35/kg for Rs, with Os making €3.15-3.20/kg. P-grades see P+3s on €3.00/kg, with the plainer P3 at €2.80-2.90/kg. The surge of dairy cows going to the factories has had some with beef to sell raising some fundamental questions: should very poor dairy cull cows be in the human food chain to begin with? Should those farmers who specialise in producing quality beef animals really be in competition for supermarket shelf space with 10- and 12-year-old dairy cows? Would a policy of eliminating older or poorer-grading dairy cows from our food chain be of benefit to the beef man and a reassurance to consumers? Meanwhile, reports from the latest inter-agency fodder committee meeting indicate that their thinking is that those who find themselves short of fodder should attempt to buy their way out of the problem. The strategy being advocated by the overwhelming majority of the committee is that efforts to either grow or buy additional feed in the time remaining this year must be redoubled. A source within ICMSA told me that a suggestion from them that those under pressure for feed should consider a limited slaughter option gained no support. The reality of course is that many dairy farmers have decided to lighten their load, and while the volume of meat gained from slaughtering those now excess dairy cows may not be overwhelming, it has still proven enough over the past month to dampen overall factory prices.